Finance Minister Mr. Arun Jaitley introduced an amendment bill for Income Tax law On 28 November 2016. According to this amended bill, who declared his undisclosed income or Black Money since the ban on Rs. 500 and Rs. 1 000 has announced will have to pay 30% tax of the undisclosed income. 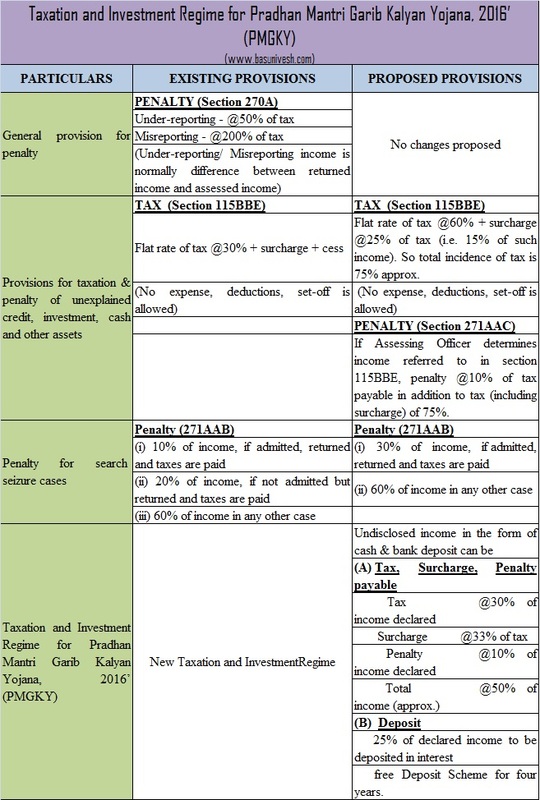 Along with 30% tax 10% penalty will also be imposed on Undisclosed Income and Surcharge (PMGK Cess) of 33% of tax amount (33% of 30% of Undisclosed Income). Moreover, declarants have to deposit 25% of undisclosed Income after demonetisation in the Pradhan Mantri Garib Kalyan Yojna. · Penalty at 10% of the undisclosed income. · Further, a surcharge to be called Pradhan Mantri Garib Kalyan Cess at 33% of tax is also proposed to be levied. · In addition to tax, surcharge and penalty (totalling to about 50%), the declarant shall have to deposit 25% of undisclosed income in a Deposit Scheme to be notified by the RBI under the ‘Pradhan Mantri Garib Kalyan Deposit Scheme, 2016’. No interest will be paid to the owner for this. After four years the owner can reclaim his money (25%). · Penalty at 10% of the undisclosed income, penalty will be Rs. 50,000. And above that 25% of undisclosed income in a Deposit Scheme that is Rs. 1.25 lakh will be locked in for 4 (four) years without accruing any interest. What is Penalty for those who continue to hold Undisclosed Income ? · Penalty for under-reporting on income is flat 50% tax and 200% tax on misreporting. And are no changes to them. How does tax on Undisclosed income compare to if one does not declare the Income and is caught? If Assessing Officer determines income referred to in section 115BBE, penalty at 10% of tax payable in addition to tax (including surcharge) of 77.25%. Example of undisclosed income of Rs. 5 lakh : In addition to Rs. 3.86.250 lakh, Rs. 30,000 is to be paid. Example: Say, income undisclosed and thus seized or searched is Rs. 5 lakh. This locked into the Pradhan Mantri Garib Kalyan Yojna will be used for the Government projects of irrigation, housing, toilets, infrastructure, primary education, primary health and livelihood in order to spread justice and equality.